Comparing estimates using time-independent sizing is relatively simple when your work items are well-defined. But not all product backlog items (PBIs) are so clear. One approach to addressing the issue of poorly defined PBIs is to spend time refining the items as you go. This takes time, but it need not increase the total time your team spends on planning if it’s done with discipline. It can even help improve reliability and velocity. In early versions of Scrum, a sprint started with a time-boxed planning meeting. Planning meetings could be long, drawn-out, and frustrating as teams attempted to estimate PBIs that were overly vague. The Scrum Guide now specifies, in addition to the planning meeting, a refinement process that occurs continuously. During refinement, the team estimates and adds detail and order to PBIs. 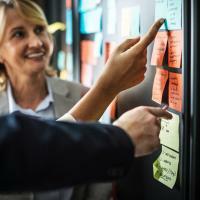 Refining the backlog continuously helps the team deliver consistently, improving the quality of their work, and can lead to shorter planning meetings at the start of the sprint. Refinement meetings improve team productivity by improving flow. The output of the estimation process isn’t just a number. It’s also understanding. Estimation conversations can expose options and complexity in both the requirements and the implementation choices, even for the most well-written user stories. Rather than leaving the discovery of questions to a start-of-sprint planning meeting that has a time constraint, a regular refinement process lets teams tackle estimation in small pieces. Refinement won’t avoid all questions; discovering alternatives and problems during implementation is inevitable. But ongoing refinement can limit the questions to smaller, more easily resolvable ones that won’t stop the team in its tracks. The challenge is how to have a refinement process that doesn’t tie up the entire team in meetings. The Scrum Guide suggests that refinement be limited to 10 percent of the team’s capacity—so for a two-week sprint, refinement would take one day. Keep refinement meetings short and time-boxed, rather than focusing on the number of product backlog items you cover in each session. The time spent in refinement can lead to a shorter planning meeting, but even if not, it can lead to a planning meeting that runs more smoothly and ends with higher confidence in the commitment. Ideally, all team members should be included in refinement conversations. Don’t divide and conquer excessively in an attempt to optimize for time, as you may find that you missed important questions or insights that you will then have to revisit. Also consider tabling stories for which the business needs are not clear. Every backlog item you cover should have an estimate or clear action items at the end of a session. Agile planning is a balance between precision and accuracy, so you don’t want full specifications for every product backlog item. But you do need to understand what you are estimating. By spending a bit of time making sure that the team has a clear understanding of the scope of the items on the backlog as you estimate, you’ll be able to deliver business value more predictably, and often faster.